My manager showed this book to me yesterday, and I wanted to share it with all of you! Someone (we never really see who) has baked some yummy cookies! 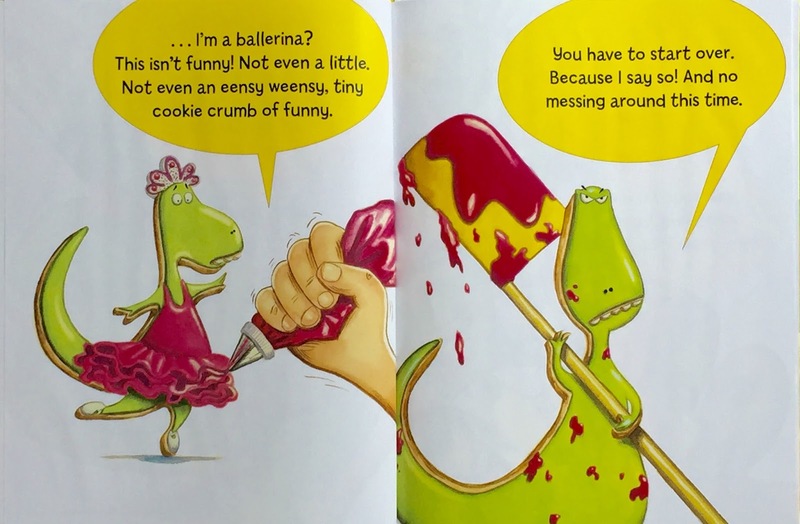 Right away, the dinosaur cookie tries to take charge, asserting that he is "King of All Cookies" and should be frosted first, and the baker obliges. 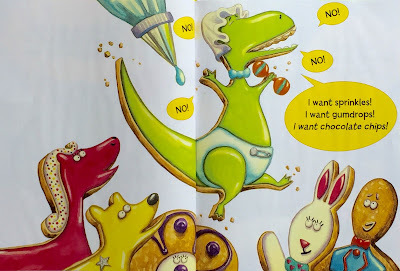 My boss knew I would love this book because (1) I love dinosaurs, (2) I used to be a professional cake/cookie decorator, and (3) I love funny books. It's not likely to win any awards because it's not the kind of high-brow thing award committees look for, but it is pure fun! I think the humor in this book is very clever, but very relateable. It reminds me a little of Kelly DiPucchio's books Everyone Loves Bacon and Everyone Loves Cupcake, but it has more dialog and the humor will be easily understood by kids, whereas the humor in DiPucchio's books is more subtle, relying on clever puns and such, and seems meant more for adults. And if you need more meaning or some kind of lesson, it definitely shows the consequences of being rude, demanding, bratty, and selfish can be unpleasant. I love the illustrations in this book, they are rich and detailed, without being too distracting, and strike a perfect balance between being realistic and cartoonish. I like that the focus is always on Cookiesaurus Rex, and we only see glimpses of the hands (and mouth!) of the person decorating him, though it is obvious they belong to a child. The endpapers are a nice touch as well; in the beginning they show an orderly scene with all the decorating supplies and cookie cutters neatly laid out, and in the end we see the aftermath! 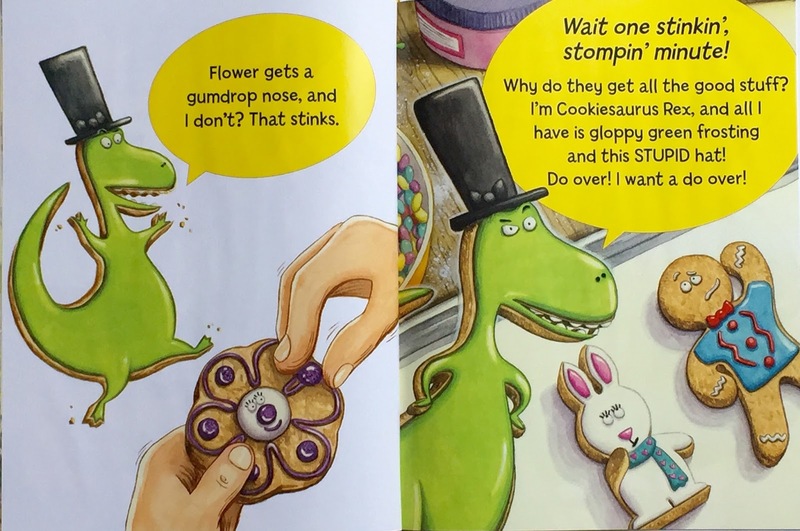 The illustrator clearly has experience decorating cookies. There are also dinosaur footprints left in icing across the title, verso, and acknowledgements pages; another nice detail. I can't wait to use this book in storytime! 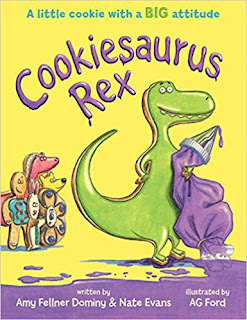 It could go with several themes: dinosaurs, cooking, cookies, etc., but of course you could go always go with a theme of "Great New Books". If you have any cookie-decorating programs coming up, it would be a great complement to that. I already have a general "Food" theme planned for the two-week rotation between "Thanksgiving" and "Christmas", so I plan to use it then. I can't wait; I know the kids are going to love it! The more I think about it, the more I would LOVE to re-tell this story using real decorated cookies, then leading into a cookie decorating program. I'll have to see if I can make that happen, either as an inclusive, neutral cookie-decorating party that is near a certain winter holiday, or maybe as a summer school-aged program. I came across an interview with the authors and illustrator where they talk about the creative process, where the original idea came from, and their favorite parts of the story at The Children's Book Review.